It’s not surprising we get a lot of requests for conference papers from our own four annual cornerstone conferences: Family Law Institute, East Region Solicitors’, DCAO Criminal Law, and Civil Litigation Updated. 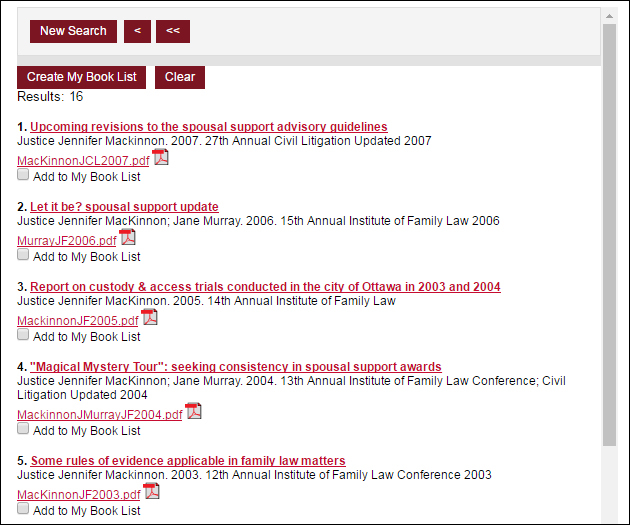 What more people don’t know is that we post the papers on our website in CCLA Conference Paper Database afterwards! So even if you aren’t able to attend, you can check out what sessions were held and keep up to speed on the current issues in the profession. They are also useful for specific practice directions for the East Region, or summaries of recent local cases and precedents. And now I can browse and download whichever ones I am interested in by clicking on the link next to the PDF icon. If I do not know the author, I can also search by subject. Additionally you can search by specific conference and year by clicking on the “Advanced Search” button on the main search screen. It’s a great way to keep apprised of the work of the local bar! As always, we’re here to help, so let us know if you have any difficulties finding papers from our events and we’ll see if we can send them to you. The database goes back to 2001, but we are often able to scan and send papers from prior to that as well!